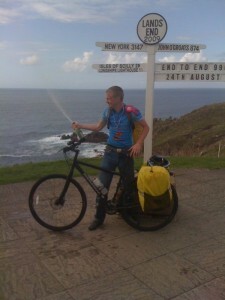 I made it all the way from John O’Groats to Land’s End. I am, so, so proud of myself. It’s even more amazing, since I did well over half of the cycle by myself, since Mike pulled out of the End to End cycle and ended our 3 year relationship at the same time. It just goes to show that I am a lot stronger that I use to be. You still have to to donate money to the National Autistic Society, via my justgiving page at www.justgiving.com/endtoend09. You can also check out photos from the cycle at www.endtoend-cycle.com. Oh and also happy birthday to my wee brother Craig.